Thanks to the Flite Test crew, I've started on an incredibly fun journey with swappables. 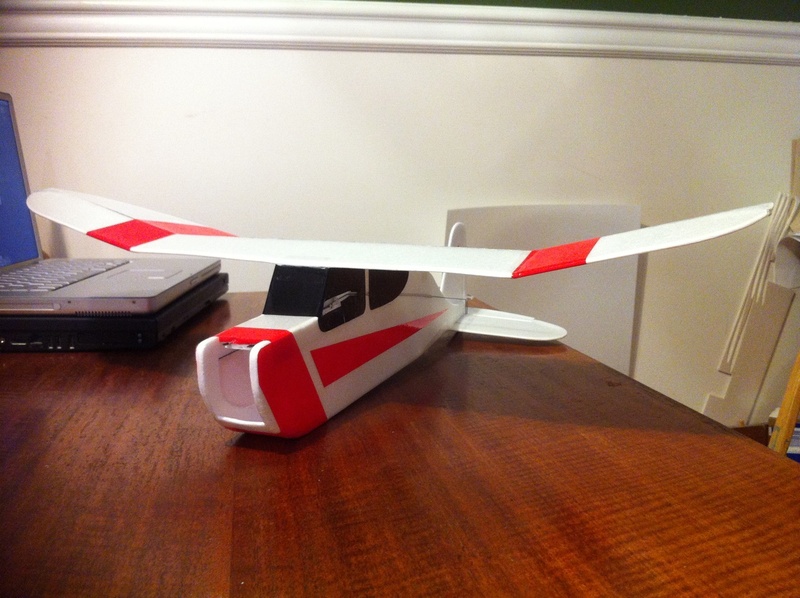 I started with the Old Fogey because it looked like a super easy build and a really easy flyer. I didn't want to spend days or weeks building something that either didn't work for me or I destroyed during the maiden. I scaled it and the power pod down to my preferred size (60% or about 560mm/22in.) 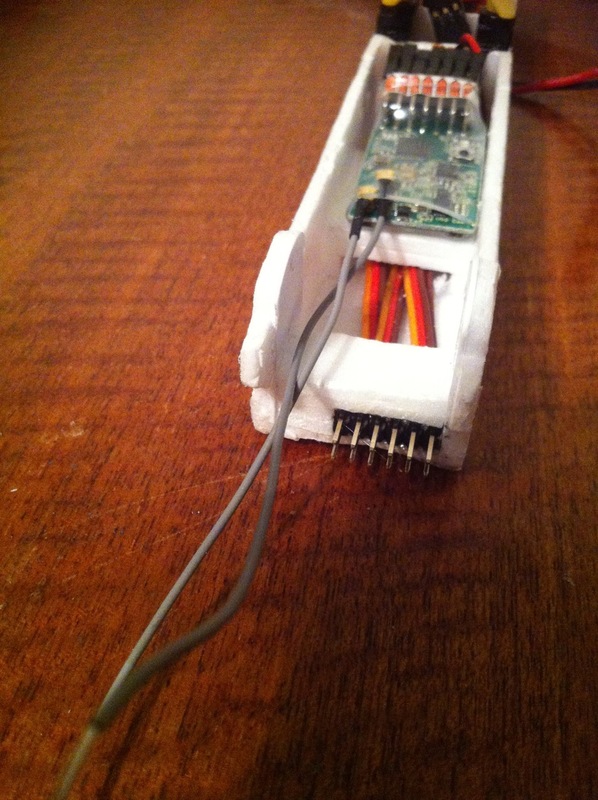 and mounted the rudder and elevator servos on the power pod. I use micro control rod keepers (Hobby King equivalent to Dubro EZ Clips) on all my models anyway, so it made sense to me to reduce the number of servos I'd have to buy when building a fleet. It's a bit more complicated to remove the power pod now that I have to release the clips and unhook the control rods, but it works for me. It delivers around 300g thrust--overkill for a 120g slow flyer like the Old Fogey, but it's what I had in my parts bin. By the way Flite Test guys, awesome work on this plan! Thanks. I had such a great time with the build and flying the Old Fogey that I started looking at my build list and wondering if I could use the power pod. The answer is YES! 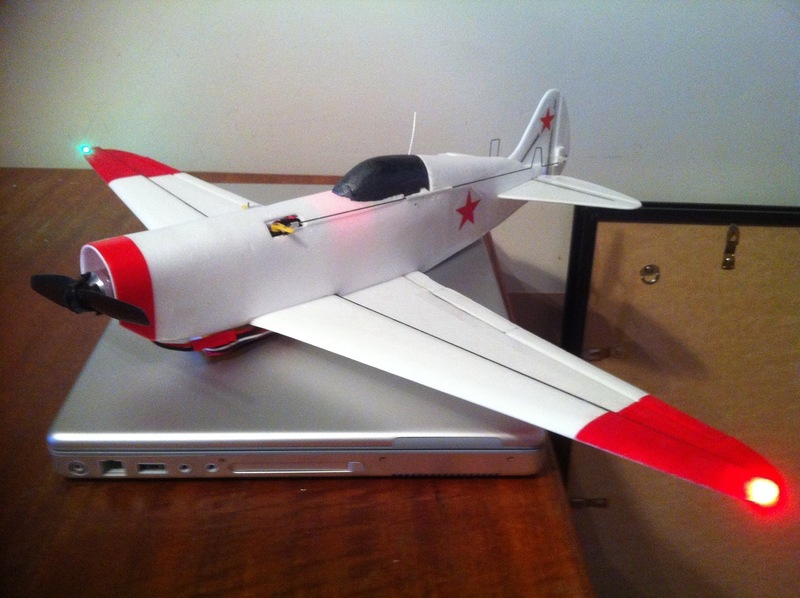 I started my next build--a MiG-7--and adapted it for the power pod as I built it. Then I thought, "This is a war bird... I'd like to have it scream"
500mAh 3S LiPo (Zippy Compact, 25C)--still waiting to receive. I also used full-range FrSky 6-channel receiver. This weekend, I'm hoping to finish the build and maiden it with both power pods. I've already built scratchies of the last 4, so if I never get to them I'm okay with it. Anyone else planning a fleet of swappables? I like the looks of the Mig-7. I would be a bit leery of the KF airfoil with those very tapered wings. Be ready for high-speed stall. You may find it quite "snappy." More importantly, let us know and see the video. A red star and a stripe and you is in winter camo. Just one task left before the maiden: affix the removable canopy. I ended up using some pin headers I had and mounting the servo connectors in one of the formers so that when the power pod is inserted, the aileron and nav lights get plugged in. I have my doubts where the CoG is, so I've mounted the battery on the bottom with a strip of velcro to test it out. There's room in the front under the power pod and under the canopy. At 153g I doubt it'll fly well, but it was a fun build. I've had a couple flight sessions, sorry no video yet. The AUW was at the 153g previously mentioned. As I expected and as earthsciteach pointed out, there was quite a high stall speed. It's what I would expect from a high altitude interceptor--needs to fly fast. I did make a couple swaps. 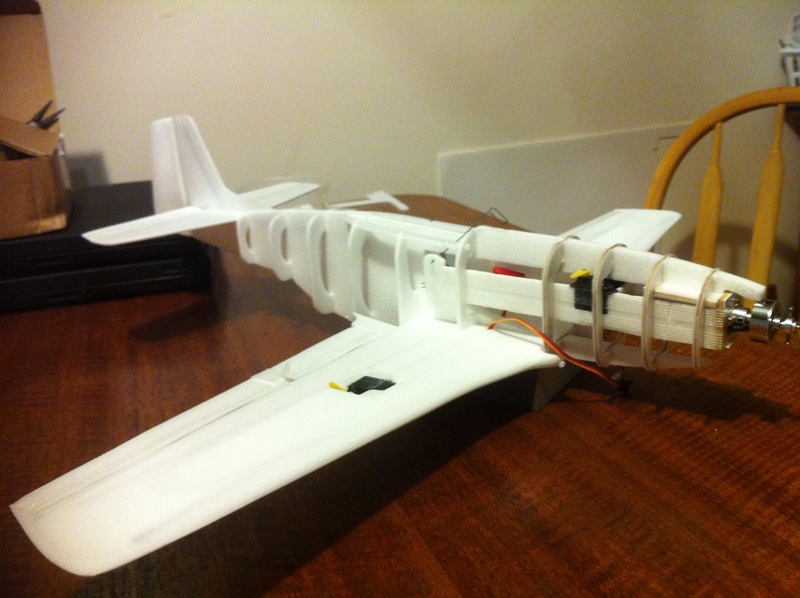 Instead of the 500mAh LiPo, I used a Turnigy nano-tech 2S 300mAh 35-70C LiPo and instead of the Master Airscrew 6x4, I used an APC 6x4--which lowered the AUW down to 131g. What a difference 22g makes. It's still got a fairly high stall speed (need to maintain at least 50% throttle to avoid stalling), but what pep! I'm not sure how much thrust it's got, but it goes vertical quick enough for me to say, "Whoa!". My task this weekend is to get my hatcam fine tuned and get some video of this beauty in flight. I learned a bunch of things today. Mostly that my hatcam needs a lot of work. I did however, manage to get a bit of somewhat useful video of the MiG-7 in flight. I stripped the audio because I tend to use the camera to record notes, observations and suggestions about the flight. It moves like a Japanese Zero. This past weekend I spent more time flying than building, which tells me that build season (a.k.a. winter) is waning. Even still, I think I can get one more project completed before I look out the window from my workspace thinking, "I should be out there." That project is a Gee Bee R3 (attached). Swappable, of course. With the MiG-7, I modified all my power pods to have pin headers (attached) in the back for extra fuselage-mounted servos. So, when I insert the power pod, the servos get plugged in--no messing with wires. Time to get ready (and fly to) work. That is brilliant! Except one little thing, what happens in a crash? I love the idea, just curious about the pins. Having crashed more than a couple times, I can tell you that the front of the fuselage and power pod absorbs nearly all the impact. Of course, I haven't run anything straight into the ground to test it. All my crashes have been from stalls or wing dips at low altitude that cause grass cartwheels. So far, the foam has crinkled a bit on the nose, the front pod mount in the fuselage has dislodged and the front of the port wing separated from the fuselage a bit. Nothing a little CA and tape couldnd't cure. 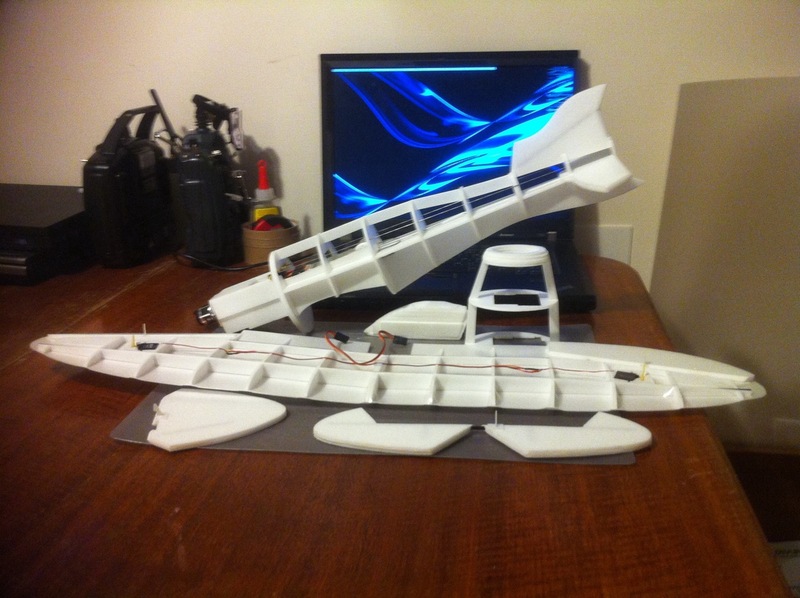 On the last set of tabs, I've reinforced with polystyrene sheet on the power pod and fuselage. I use a tweezer-like pin (bent control rod) to secure to the fuselage but still allow easy removal for in-field swap outs. Also, on the MiG-7 (and soon to be Gee Bee R3), there's a 1/32" plywood bar that the servos rest against in the fuselage. I'd hope that's enough stress relief. I'd greatly appreciate suggestions--I'm just going with what I came up with during the MiG-7 build. Well, strange weather has extended build season. -control rod tubes are inset into the fuselage. 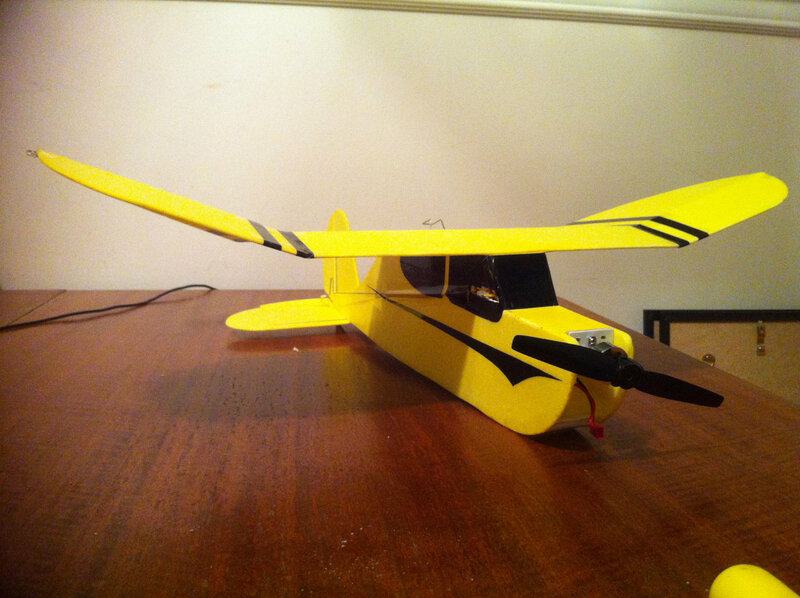 Now the wings don't flutter on full-throttle descent and the model is much more responsive (read less stable). This is the first model that my wife has made a contribution. It's hidden by the main wing in the photo, but there's a maple leaf on the vertical stabilizer. My wife had a maple leaf punch that was the perfect size, so I put some of the wing tape on overlapped freezer paper and punched a couple maple leafs for home-made stickers. 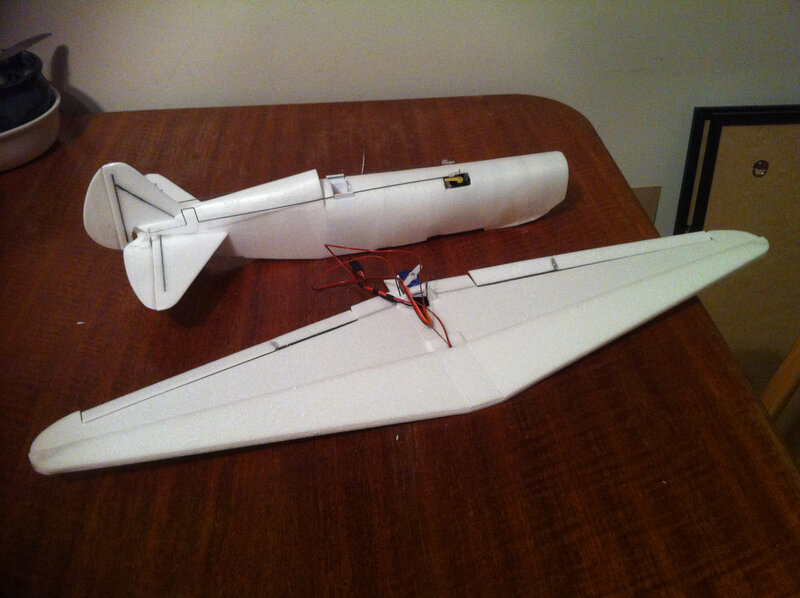 -used 3-ply 1mm Depron, 1.5mm balsa, 1mm Depron for front pod clip. Next up is a P-51D mustang and maybe I can get some more work done on the GeeBee R3 now that I have some experience with skinning models. Solid build skills Sir, Im impressed. Just got back from the field and reviewed my hatcam footage... really nothing useful. The MiG is just too fast for the limited field of view of my camera. I think I'll buy another couple cameras and make myself a panorama hatcam. I took the Mig-7 v2 out on a 2S test. I'm still shaking--half exhilaration, half terror. The first 2 tosses (and minor crashes--only cosmetic damage) were getting the trim down, then on to business. It flies as faster than the other MiG (greater weight/wingspan). The thing is an absolute terror in the sky. I recently watched a bunch of warbird videos on SuperiorHistory's YouTube channel and other channels. The MiG was able to mimic the maneuvers I remembered with ease. Very realistic climb rate. Not to mention that the thing just looks scary in the air. With that said, I'm not sure if I want to try 3S--at least not in the wind today (16km/h). I created a flaperon mix forthe 4th toss and that helped quite a bit with landing (slower, more controllable). I noticed a bit of tip-stall at less than half throttle, like the other MiG-7. In the top third, it really tightened up and flew like a real warbird. I'm super excited about this plane, but it's definitely not a laze about flyer. I had to concentrate every second. Every once in a while, I have a moment where my excitement about the hobby breaks through what I thought was possibe. Today, when I mimicked a strafing run--and filled with excitement and terror--was one of them. Hope to get some decent video of it soon. Yesterday was an interesting one. Coming in for a strafing pass (a few feet above my head as usual) with the MiG on 2S, I saw movement out of the corner of my eye. It was a Red Tail Hawk gunning for my plane (which does sort of look like a dove--the hawks primary food in my area). I managed to out maneuver the hawk for a bit, then decided to get some altitude and distance. Just then, LVC! There was no way I could get away at half throttle (on 2S anyway). I quickly (but gently) turfed it, but the hawk started preparing for a dive. In a fit of desperation (and maybe stupidity too), I ran screaming towards the my plane and the approaching hawk. Yes, I deserve a Darwin award for going up against nature like that. I did scare the hawk away though and just in time to go to work. Anyway, I have a bit of news on the swappable fleet front. 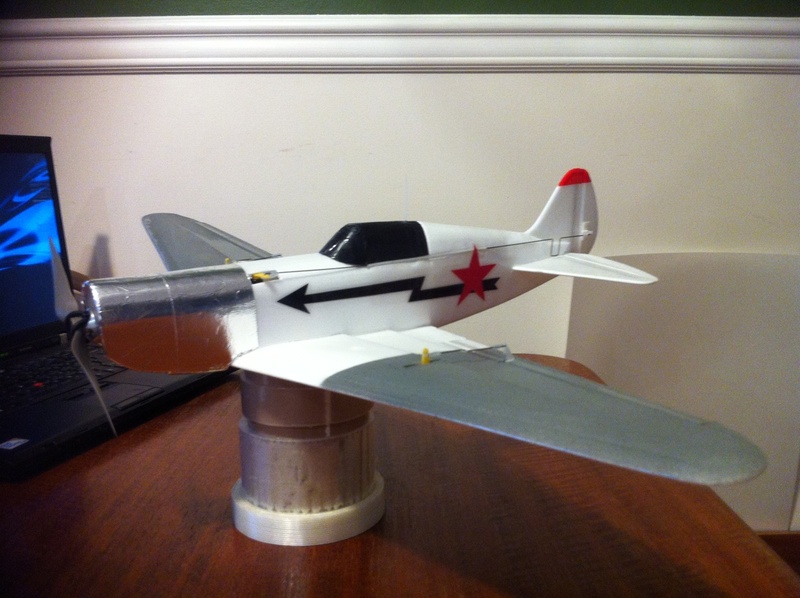 I've been working on a P-51D Mustang for a few weeks. I just need to suss the rudder/elevator control rod paths, then I can cover the fuselage and make it pretty. To keep in-line with the other plane sizes and have enough material on the ribs to maintain integrity, I used 3x 3mm Depron sheets with a CF spar sandwiched in. Because this makes the fuselage (in full scale) 9 inches wider and in flight the power pod 'sings', I'm calling it "The Fat Lady". I've found a neat cartoon of the classic viking opera singer to put on the nose. Next, dictated by my 21 month old daughter is going to be Zazu (from the Lion King). After that, I have to make a witch on a broom for Hallowe'en and finish a non-swappable Santa's sleigh (and 9 reindeer) for Christmas. Unfortunately, my daughter didn't co-operate at the park today, so no video. I did however test out HKs Doppler app--a complete bust as it crashes when it processes a reading on iOS 5.1 (and no, I won't upgrade to 6). The passes had to be upwind because of obstacles. So since the passes were upwind, should I add 6-7kph to the speeds? Even without adding the wind, it's about 20kph faster than I had estimated. I hope after a nap, my daughter is more amenable to letting my wife do some video for me. Finally got some video--such as it is. I used my iPhone, propped up against my sunglass case. I've gotta say, flying inside the 'box' is difficult with this plane.